When we founded JAF almost 11 years ago, we could hardly have imagined where this journey would take us. We had just been through Joe’s battle with cancer – and, after witnessing first-hand how stressful the entire diagnosis and treatment cycles can be – we came out the other side with a newfound energy and passion for helping others battling the disease. That energy and passion has maintained itself for over a decade for one reason: the patients. We are constantly blown away by the positivity and strength of the patients and family members we have met over the years, and thanks to YOU and JAF’s incredibly loyal army of supporters, JAF has been privileged to provide thousands of financial assistance grants to patients in need. Yesterday, at the Dana-Farber Cancer Institute in Boston, we had the honor of hand-delivering the Joe Andruzzi Foundation’s milestone 10,000th financial assistance grant to Katie Crowell – a strong-willed wife and mother of two beautiful girls, who has fearlessly battled breast cancer since she was pregnant with her youngest. To us, Katie’s courageous spirit perfectly represents not only JAF’s 10,000th grant, but all 9,999 before it, as well as the next 10,000 in need and beyond. In the coming weeks, we look forward to sharing more from yesterday’s surprise grant presentation – in the meantime, we urge you to read Katie’s JAF Patient Story below. Katie Crowell has always been an active person. An avid runner, she’s already completed 27 marathons in her 38 years. The 2019 Boston Marathon will be her 28th, and likely her most challenging. Her story starts in 2015. Katie and her husband Mike (also her running partner) were excitedly expecting their second child. Their daughter, Elizabeth, was just 3, and Katie had decided to leave her part-time job to focus on the family. Their life was work, family, running and planning for the next member of their family to arrive. Life was good. 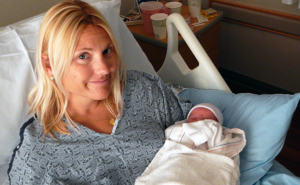 But in the early part of her pregnancy, Katie started getting extremely tired. At her annual physical, she mentioned this to her doctor, who chalked it up to being pregnant and running too much. As time went by and the fatigue didn’t subside, Katie started to think this was more than simple tired from being a pregnant and active mom. Then came chest pains, and eventually, a diagnosis: stage IV metastatic breast cancer. Can you believe Patriots’ Day is just over two weeks away? 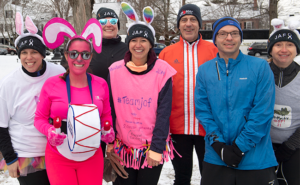 Our 2019 Team JAF runners have navigated training and fundraising all winter-long, and now they are all cruising down the final stretches of their Marathon journeys! To date, the team has raised over $130,000 towards its goal of $185,000 – all in support of JAF’s mission. One of the final milestones for Team JAF runners in any Boston Marathon season is CharityTeams annual “Hop 21” (mile!) run, where participants dress in Easter Bunny-themed costumes while conquering their longest training run to date. The event always produces some amazing photos, so be sure to head over to JAF’s Facebook page to see the full album (here). And if you haven’t had a chance already, be sure to follow this link to view our full 2019 Boston Marathon roster and consider donating to help push our runners’ fundraising campaigns over the top! We can’t thank ALEX AND ANI enough for their generosity and continued commitment towards our mission and the patients we serve. 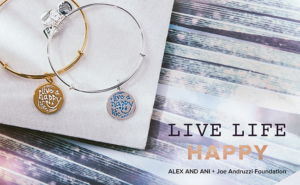 Though it is bittersweet to say goodbye to the “Live A Happy Life” bangle, stay tuned for some exciting news later this year!